Since 1990’s researchers all around the world have studied forms of schizophrenia prevention in order to avoid or at least postpone its onset (YUNG, MCGORRY, 1996). Studies on the subject proliferated in psychiatric literature and new forms of categorization of schizophrenia proneness have been put forward in the last decades (FUSAR-POLI, 2013). 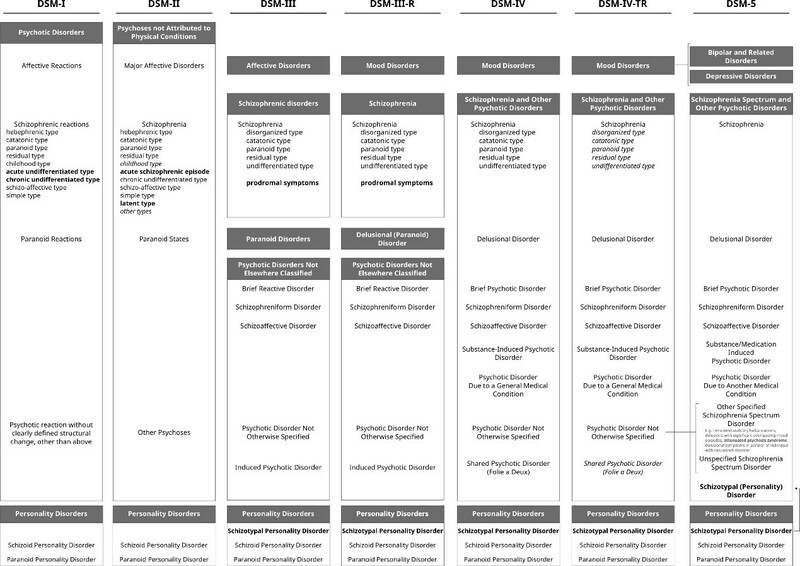 In the discussion that preceded the publishing of the Diagnostic and Statistical Manual of Mental Disorders (DSM-5) by the American Psychiatric Association, a new diagnostic category was proposed to encompass the main clinical pictures related to the risk of schizophrenia development. The debate about advantages and disadvantages of the inclusion of this category, the Attenuated Psychosis Syndrome (APS), was heated and APS ended up being rejected from the main section of the manual, thus not available for diagnostic purposes (GONÇALVES, DANTAS, BANZATO, 2016). In the article “A historical account of schizophrenia proneness categories from DSM-I to DSM-5 (1952-2013)”, published in Revista Latinoamericana de Psicopatologia Fundamental (Vol. 21, No. 4), Arthur Gonçalves et al. showed that the debate about schizophrenia prevention actually preceded DSM first edition (1952) almost in three decades. They also pointed out that, even before that, there already was in the international psychiatric literature proposals of categories used to diagnose conditions prone to the disorder, with important similarities to current categories. Through the performed historical review, whose focus is on the US psychiatry, it becomes clear that although the specialty has changed over time, some questions related to its practice are still open to debate. Thus, the authors indicate that APS was an innovative proposal that incorporated sophisticated elements of contemporary psychiatry, such as the varied range of consistent scientific evidence, but that was rejected due to unintended feared consequences, like the possibility of stigmatization of diagnosed patients (which could be pejoratively be considered “pre-schizophrenics”) and excessive and inadequate prescription of antipsychotic medication, even when not scientifically recommended. The authors conclude the article suggesting that, from the evidence they found in their historical research, good psychiatric practice requires far more than up-to-date scientific data, being also necessary to acknowledge and discuss philosophical, sociocultural and ideological influences that shape psychiatric practice since its origins. Figure 1 – Evolution of psychotic and psychotic-like disorders along the DSMs. American Psychiatric Association, Diagnostic and Statistical Manual of Mental Disorders (1952, 1968, 1980, 1987, 1994a, 2000, 2013). In bold, categories linked at least temporarily with schizophrenia proneness states. In italics, categories removed in subsequent printings. Psychotic-like personality disorders were included for context clarification. Source: The authors. FUSAR-POLI, P. et al. The psychosis high-risk state: a comprehensive state-of-the-art review. JAMA Psychiatry, v. 70, n. 1, p. 107-120, 2013. ISSN: 2168-6238 [viewed 1 March 2019]. DOI: 10.1001%2Fjamapsychiatry.2013.269. Available from: https://jamanetwork.com/journals/jamapsychiatry/article-abstract/1392281. GONCALVES, A. M. N., DANTAS, C. R. and BANZATO, C. E. M. Values and DSM-5: looking at the debate on attenuated psychosis syndrome. BMC Medical Ethics, v. 17, n. 7, 2016. ISSN: 1472-6939 [viewed 1 March 2019]. DOI: 10.1186/s12910-016-0090-8. Available from: https://bmcmedethics.biomedcentral.com/articles/10.1186/s12910-016-0090-8.